April 26 is celebrated as International Seed Day when you rejoice in the vast biodiversity of the world— shrinking at a horrifying rate—and also fight for seed and food sovereignty. The last two appear to be a losing battle. In India, control of seeds has slipped out of farmers’ hands into those of the companies. Food diversity is under threat and it is the market that dictates what we eat or don’t. But the question this column is dealing with is simple: can a farmer infringe patents simply by planting soybeans he has bought in the open market? The answer, though, is complex. The legalities of seed ownership in the US are many: how long does a patent last, does it apply to second-generation seeds and does patent exhaustion apply at all to proprietary seeds? And since the case involves the notoriously litigious biotech giant Monsanto, it becomes even more significant. The Monsanto versus Bowman lawsuit, which was initiated in 2007, has just reached the US Supreme Court which has asked the US Justice Department to weigh in on the controversial issue of patent rights exhaustion. Normally, a patent owner’s rights are “exhausted” when the product is sold to an end user. The case promises to be particularly instructive for those interested in seed rights and farmers’ sovereignty. In September 2011, Monsanto, which has the largest share of the global market for seeds, won yet another case—its website lists its many victories— for patent infringement against Indiana farmer Vernon Bowman for planting and saving its herbicide-tolerant seeds although he was using only undifferentiated “commodity” seeds. Commodity seeds are a mix of seeds that come from farms using Monsanto’s patented Roundup Ready technology and others that do not. As such, no licensing agreements are required for the sale of these seeds. Here is the genesis of this case: Bowman bought Monsanto’s Roundup Ready soybean, a herbicide resistant variety, from its licenced seed producer Pioneer Hi-Bred and signed a contract that contained restrictions identical to Monsanto’s Technology Agreement that does not allow farmers to reuse the seeds. From 2000 onwards, Bowman continued to buy seeds from Pioneer and planted them each year as first crop in each season; scrupulously, he did not save seed from this crop. But Bowman also bought commodity soybean seed from a local grain elevator for his late-season second crop and applied a glyphosate-based herbicide on them. Quite a few of these plants exhibited the glyphosate tolerant trait, and he saved the seed from this harvest for replanting as his second crop. He also supplemented the supply with regular purchases from a grain elevator. Monsanto, which clearly boasts intelligence capabilities better than that of the CIA, learned of this and wrote to Bowman. Thereafter, in 2007 it sued the farmer. In September 2009, the district court granted summary judgement against Bowman, ordering him to pay US $84,456.20 to Monsanto. Bowman appealed to the Court of Appeals for the Federal Circuit arguing that Monsanto’s patent rights were exhausted with respect to second-generation soybean seeds. Besides, the seeds were bought in grain elevators as undifferentiated commodity. Patent experts say that according to the doctrine of patent exhaustion, the first authorised sale of a patented item terminates all patent rights on it. 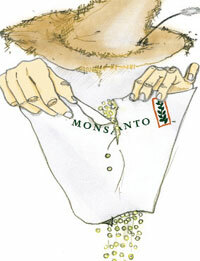 Monsanto, however, contends that the doctrine of patent exhaustion does not apply to sales of second-generation seeds. It also claims that a licenced grower’s sale of harvested soybeans to a grain elevator is not an “authorised sale”. To an ordinary reader this issue would appear as a bizarre claim: how can there be patent infringement if the seeds are sold in a mix of undifferentiated “commodity” seeds? If that argument makes a non-legal person’s head spin here is more: Monsanto also argues that even if the doctrine of patent exhaustion is applied to commodity seeds, Bowman remains liable for patent infringement because patent protection applies independently to each generation of soybeans that contains the patented trait. The more troubling issue here is this: with seed companies, specially Monsanto, having carpeted the market with their GM seeds—94 per cent in the case of US soybean—how would a farmer who did not want to grow the patented GM variety go about it? Think about it.